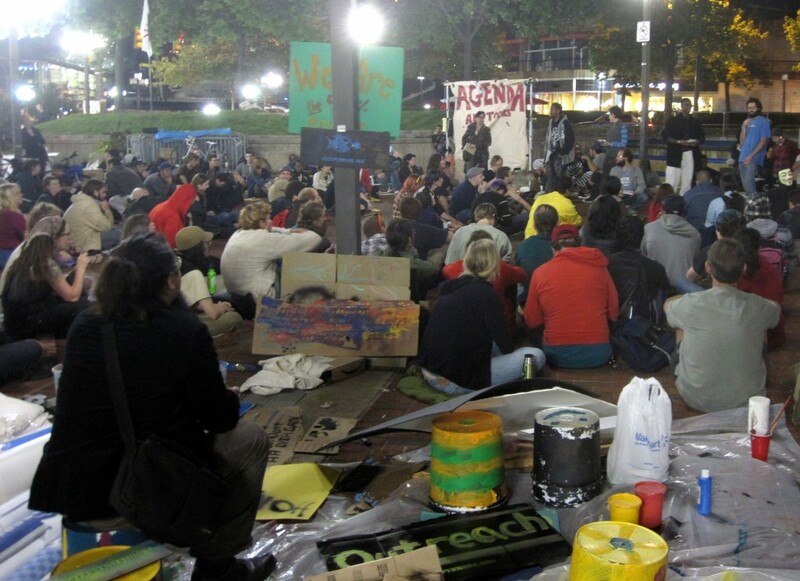 A meeting of the Occupy Baltimore movement. Traffic backed up along Baltimore’s inner harbor last week as protestors from the “Occupy” movement waved signs and shouted at the passing drivers. 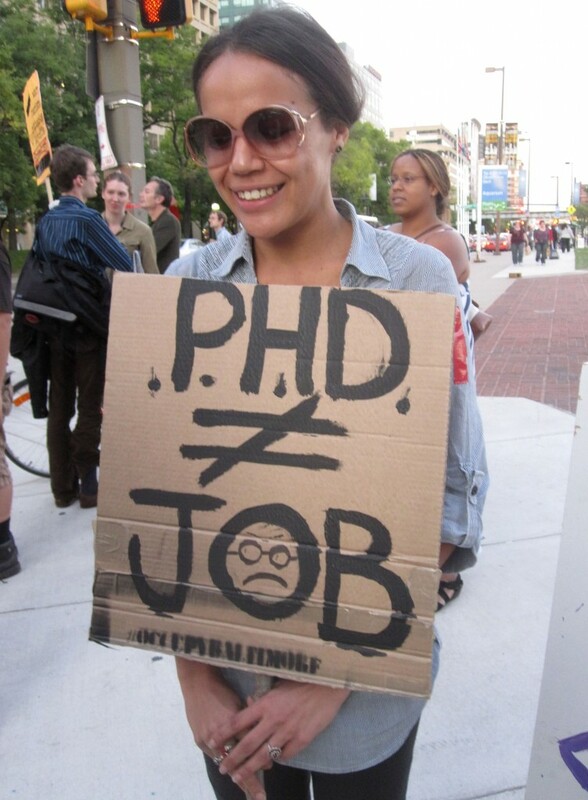 And among the protestors were scientists and science students, unhappy with their job prospects, their funding prospects, and the way science is viewed in America. That’s a shorthand way of saying what has become all too familiar to us scientists: lengthy training and academic credentials no longer suffice to launch a career in science. This message is a new tone in the Occupy movement’s chord. Johns Hopkins breast cancer researcher Brandie Cross protests. The Occupy protestors view corporate greed and the disproportionate power of the wealthiest 1% of Americans as the causes of a wide range of problems in America. Since September, protests have sprung up in more than one hundred cities around the country. Baltimore is a small city with many institutions of research and higher learning, so perhaps it makes sense that Baltimore’s version of the Occupy movement would involve scientists. Signs on display at the protest. And scientists have certainly had much cause to protest during the last decade. With the sidelining of the American Competes act, the failure of Congress to pass climate change legislation, and the nationwide crisis afflicting science, technology and math (STEM) education, many of us are feeling helpless and angry, not just Cross and Rubin. As an astrophysicist, I’ve watched funding sources in my field wither and my own students struggle to stay employed. Studies show that only half of U.S. adults can correctly answer the basic question: How long does it take for the Earth to go around the Sun? This statistic disheartens me. And the recently threatened closing of physics departments in Texas and Florida would not help the situation. I’m almost ready to protest too. Even so, I was still surprised to see scientists engaged in the Occupy protest. We’re generally a quiet bunch, more comfortable with armchair discussions than rabble rousing. Of course, there are some potential reasons to shy away from joining the Occupy movement at this stage. Critics have called the movement disjointed, and lacking in focus. 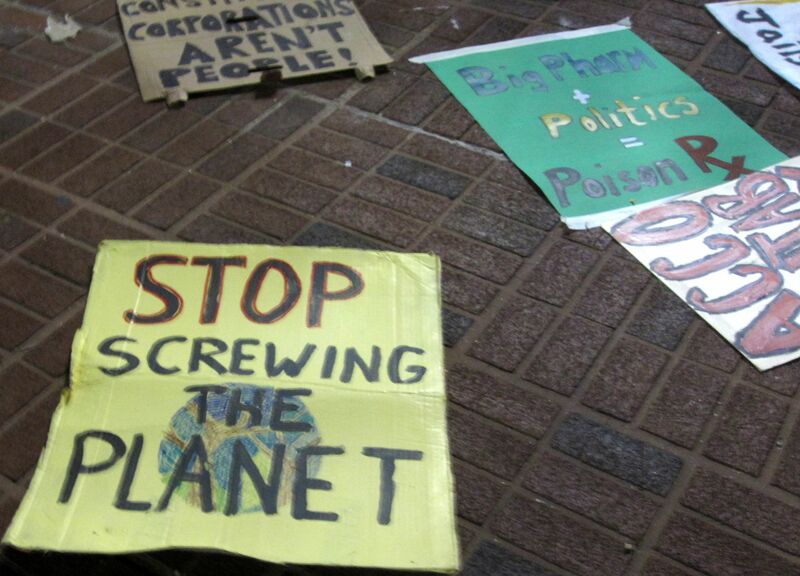 Indeed, at the Baltimore protest, I spotted signs addressing gay rights and hemp use right next to signs about big pharma and climate change. (The international climate campaign 350.org has urged its supporters to join the movement.) These may all be worthy causes, but one wonders how a single movement can effectively represent all of them. Yet the protestors seem to view the movement’s breadth as an asset, and perhaps scientists and other academics find the movement’s open approach appealing. “Part of what drew me to the movement is that they were acknowledging that there are a lot of issues,” said Jesse Crow. Crow is working on a Bachelors degree in Environmental Science and International Relations at the University of Maryland Baltimore County. There is more than one way to approach the current crises for science in America, and the best path forward remains unclear. But scientist participation in the Occupy movement shows that scientists have begun to embrace new techniques and join with new allies in an effort to influence public opinion and government policy. We have long been unhappy with the neglect of science in America and the effects of this neglect on American well-being. And now this growing movement has become a new outlet for our frustrations and a sign of our determination to overcome them. About the Author: Marc Kuchner is an astrophysicist and the author of the book Marketing for Scientists. This article was originally published at Scientific American Blogs.